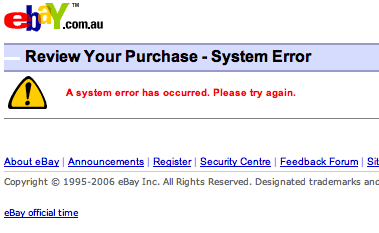 Is there any end in site to the errors of which I recieve on a daily basis from eBay Australia, regardless of whether I'm on Mac OS X, FreeBSD or Windows 2000, using Camino, Firefox or Konqueror? I've got something for your "feedback fourms"… your website has been proven to be as reliable as Enron's accounting. Newer post ← Are You South Australian?